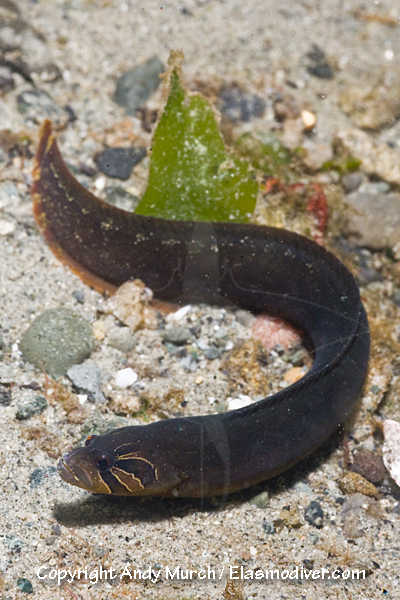 The Black Prickleback (Xiphister atropurpureus) is a common inhabitant of the intertidal zone. It is easily confused with the rock prickleback (Xiphister mucosus) but it can be distinguished by the position of its dorsal fin which starts much further back and by the dark lines radiating from it seye which do not have noticably light centres. 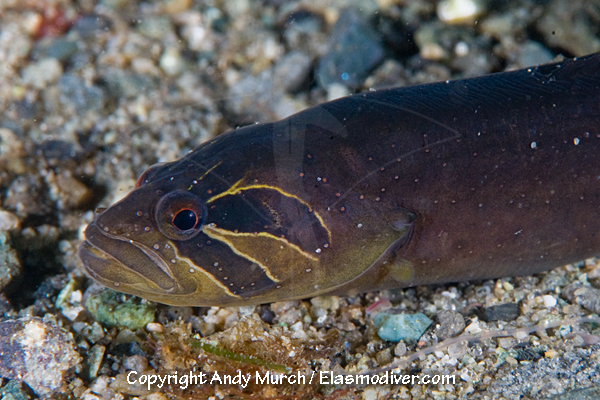 These black prickleback pictures are available for commercial licensing. For further information regarding usage please e-mail Elasmodiver. All of the images on elasmodiver.com are copyright protected. No unauthorized use of these black prickleback pictures is permitted. Please contact Elasmodiver for further information.